In the current issue, author Edgar Kraut presents a super simple system that consists of two rules for taking long positions. Formally it does not share traits of classic swing trading systems (as advertised) except for its sensitive 1% trailing stop, so with its trend condition rule and a volume confirmation rule seeking to identify and hold a rising stock for a short period of time, we would rather classify it as pure momentum trading. Figure 1. 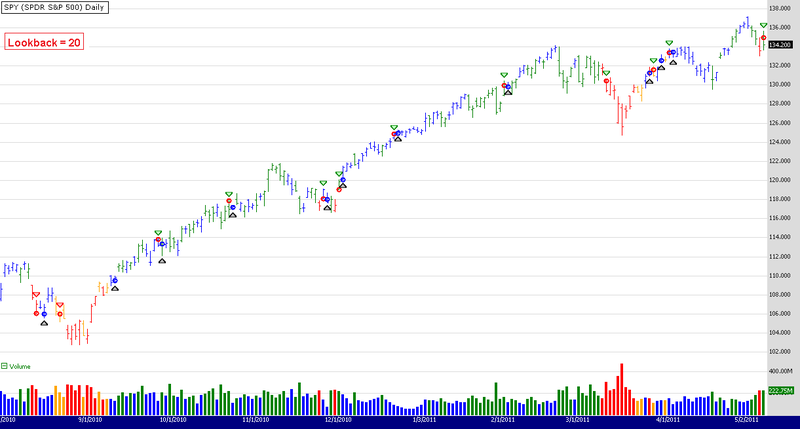 A Wealth-Lab Developer 6.2 chart showing the Color-Based System applied to a Daily chart of the SPDR S&P500 (SPY). Bearish trend starts after X consecutive closes below the trailing close from Y days ago.